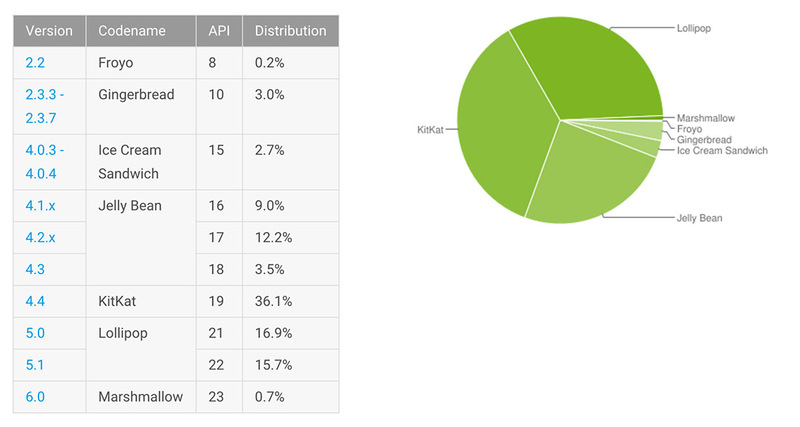 The new Android distribution numbers are out for January 2016, with little change from last month’s report. Marshmallow, the newest version of Android, is crawling along with acceptance and is only up to 0.7% from 0.5%. As for the rest of the versions, Lollipop is up to 32.6% (from 29.5%), while the rest are mostly down, like with KitKat at 36.1% (from 36.6%), Jelly Bean at 24.7% (26.9%), Ice Cream Sandwich at 2.7% (from 2.9%), and Gingerbread at 3.0% (from 3.4%). Froyo remains on the list at 0.2%. Last month’s numbers can be seem here.